Brian LeTraunik has been a professional actor since 1984, appearing in television commercials, voice overs, industrial films, print ads, feature films and live theatre. His credits at LU include directing Boeing Boeing, The 39 Steps, The Last Night of Ballyhoo, Anton in Show Business, Almost, Maine, co-directing A Year With Frog and Toad and staging fights for A View from the Bridge and Romeo and Juliet. His favorite roles on stage include Man in Chair in The Drowsy Chaperone, Polonius in Hamlet, Shylock in The Merchant of Venice, Alfie in A Man of No Importance, Lafew in All's Well That Ends Well, Prospero in The Tempest, Pandarus in Troilus and Cressida, Major Petkoff in Arms and the Man, Parchester in Me and My Girl, Skylight in Class Enemy and Dr. Scott in The Rocky Horror Show. Professional directing credits include The 25th Annual Putnam County Spelling Bee at Eastern Illinois University, the Chicago premiere of Tunnel Rat for Genesis Theatricals and the world premiere of Hannukatz, The Musical for National Pastime Theatre. 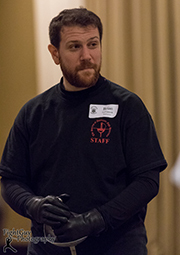 Mr. LeTraunik is a Certified Teacher of stage combat with the Society of American Fight Directors, and has taught stage combat and choreographed fights for professional theatres and universities throughout the United States. In 2015, he served as the resident fight choreographer and stage combat instructor for Central City Opera in Central City, Colorado. He is currently writing a book about the history of contemporary stage combat, to be published by Routledge in 2020. Mr. LeTraunik has taught acting, movement, voice, stage combat, musical theatre and Shakespeare performance. Before coming to LU, he taught at Valparaiso University, Eastern Illinois University, University of Findlay, Wichita State University, Coe College, Drake University, Western Illinois University, Simpson College and the University of North Carolina School of the Arts. He is a proud member of SAG-AFTRA and Actors' Equity Association.